Ashley is a Navy veteran originally from Los Angeles. 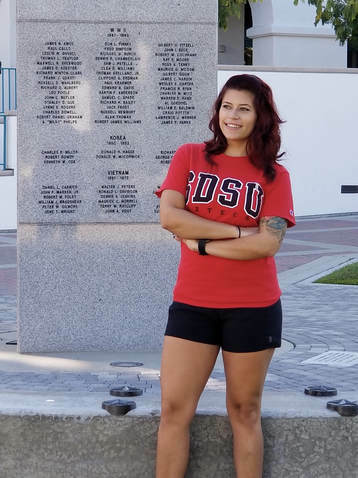 She transferred to SDSU after receiving her associate's from Southwestern College in Chula Vista, CA. Ashley is currently pursuing a Bachelors in Psychology with a minor in Russian. Ashley Bigalke served 4 years in the Navy as an Aviation Machinist's Mate stationed at HSC-9 in Norfolk, VA. She also deployed aboard the USS George H.W. Bush in support of Operation Active Endeavor, Inherent Resolve, and Enduring Freedom.